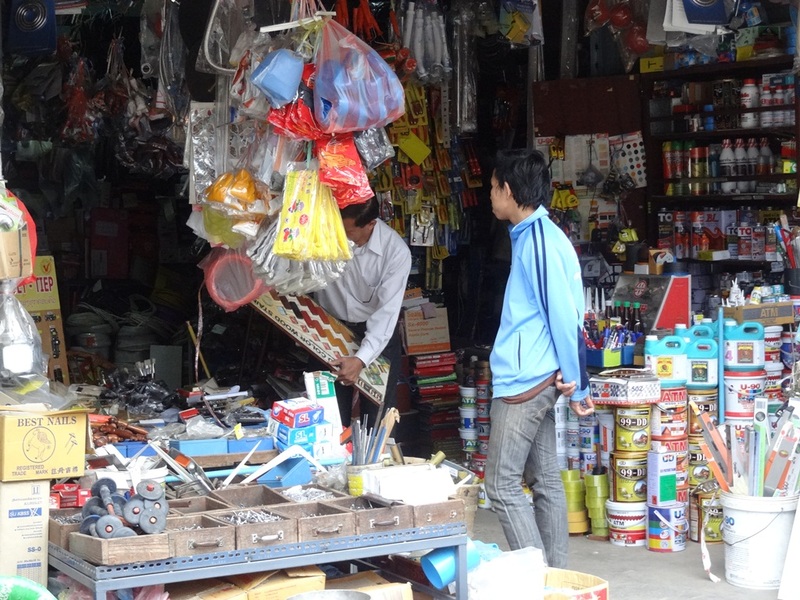 “Tschau mee gap nuu boh?”, I ask the young girl working at one of the many hardware stores on the Chinese market. At first she doesn’t understand me (which could be due to my wrong intonation of the words OR due to the fact that she is Chinese and doesn’t speak much Lao herself). She has this big question mark on her face and I repeat my question once more, the emphasis on nuu, meaning mouse. She then charades the outline of a minihouse and motions with her fingers the movement of a mouse running INTO the house. Yessss, I am thinking, she got it. As a tourist things like mouse traps, water absorbing towels, candles with a big diameter than 1 cm, soft tissue paper, table lamps, sanitary soap dispensers and grass seeds are not very high up on the shopping list but when you live and work in a country like Laos then you suddenly realize how difficult it is to get the (for us) most ordinary things. The most common answer to my very favorite and frequent question “where can I get xxxxx” is 3 letters long: BKK. Everything you can’t get here has to be ordered and brought in from Bangkok. As I have just moved to a house 2 days ago week which has, according to the couple who last lived in this house, a few stowaways in the kitchen I was very keen to eliminate those 4-legged flurry animals. But it seems to be impossible to find the good old fashioned “quick journey to nirvana”-break-a-neck mousetraps. The Lao version of our mousetraps is a little house with a sticky carpet inside where the mouse runs into the house and then gets stuck with its feet on the gluey carpet – and has to die a slow and painful – death. As this was not a feasible option for me I kept looking and asking around and finally found a shop where the sold ”mouse” traps. 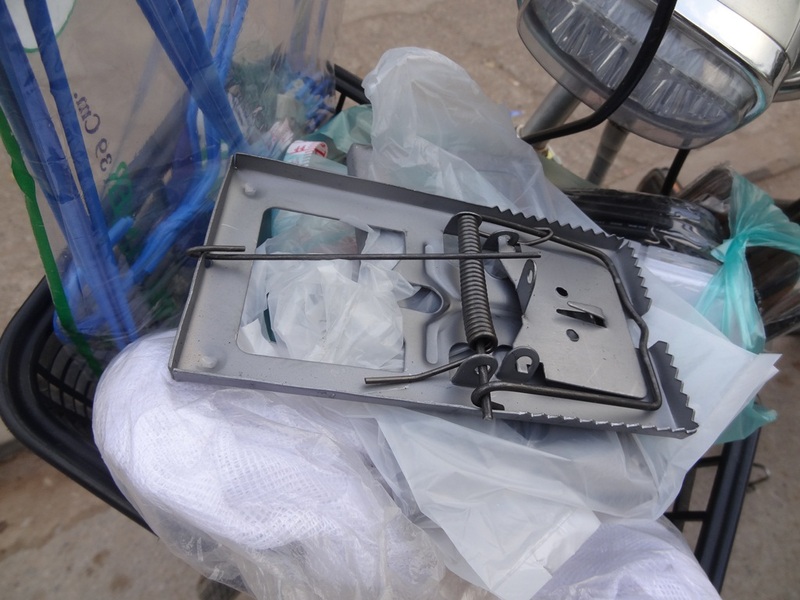 I might want to mention that those traps are about 3 times the size of ours – as they are more suited for RATS rather than mice. I needed to call pest exterminators. They luckily came the same day and sprayed my house INSIDE-OUT, with the effect that about 20 minutes later when I quickly ran into the house to grab a few clothes to sleep somewhere else for the next 2 nights I already saw many of the victims creeping around (or not creeping anymore) on the floors. I have to say that I have seen many insects throughout my life on various travels and I have also seen a lot of cockroaches before-but THOSE guys were definitely the biggest I had ever encountered. Massive. The strength they have is amazing, even after chasing and hitting them with the broom 5 times they still move. O.k. enough of the yucky stories. In the meanwhile I am enjoying a break from the tiring and nerve-wrecking last weeks in “my” own hotel: a yoga group from California has booked the whole hotel this week and since they didn’t fill one of the rooms they offered me to stay and my boss gave me the ok so as this is an extremely busy week at work anyway I really appreciate falling into a soft bed which is only 10 meters away from my office. This might be a rather unusual posting as is has little to tell about Laos, the traditions or the culture and I also don’t have exciting photos to post – but I thought that I would write and post my relocation-experiences nevertheless as they are part of my life here. And although they are not very exciting they still made me realize how different those many little “everyday things” are here in Laos and how challenging it can be to find stuff which we find in every shop. But this is my first and maybe only time in my life where I live in a house so I am taking it in with all its ups and downs. Posted by Brita Graser on 4. February 2013 in Laos 2012 and tagged SomewhatUnusualExperiences. I love hearing your stories! Thanks for sharing Brita. I always remember a sweet Laos exchange student in Algebra in High School. She taught me this. Po Ko Nu Ka Nu Sha? That is all I remember… this it ring a bell as I am certain I am far from spelling it correctly! Perhaps it was what is your name or how are you? Hmmm? I am 100% certain it does not mean, we don’t have or I don’t know! lol.